The US Marshals Service (USMS) has made plans to auction $4.3 million worth of Bitcoin (BTC) in November 2018. The agency announced yesterday, that the sealed bid auction is for nearly 660 bitcoins that were seized by the Department of Justice (DOJ) in a series of criminal investigations over the years. The virtual currencies being offloaded came from cases against convicts like Thomas Mario Costanzo and Theresa Tetley. Both were found guilty and sentenced to jail in 2018 on money-laundering charges. At the time, the USMS seized 80 bitcoins from Costanzo while 40 BTC were confiscated from Tetley. However, the agency did not disclose how much of the forfeited digital assets from the convicts would be sold next month. As published on the US Marshal Service website, the auction will be held on 5 November from 20:00 to 14:00. To participate in the exercise, interested candidates must get registered with the US Marshals Service on or before 31 October and make a deposit of $200,000. According to the DOJ, the Bitcoins will be auctioned in bundles, which consists of two series: Series A has six bundles with 100 Bitcoins while Series B consists one bundle of 60 bitcoins. Moreover, the USMS has warned that bidders will be denied knowledge of offers from other bidders and will not be able to modify their bid value once submitted. This Bitcoin auction by the US Marshals is the third major exercise in 2018, and it might not be the last. The agency sold 3,600 bitcoins back in January 2018 and thereafter, 2,170 bitcoins were sold in March. However, the agency’s biggest Bitcoin sale dates back to 2013, when Silk Road was shut down and Ross Ulbricht was convicted and bagged life imprisonment. 144,341 bitcoins were seized from Ulbricht while 29,656 bitcoins were taken from Silk Road’s servers. In 2014, the haul was sold by the agency for around $48 million. Shifting gears to Bitcoin price, we can see that the digital coin is following the bearish trend against the US dollar and it has started to break the major supports. From the past few weeks, Bitcoin and other virtual currencies have been consolidating in a range bound zone. The price of Bitcoin has been hovering at the $6,200-$7,000 level since the last 2 months. At the moment, Bitcoin is trading around the $6,500 level with a daily volume of about $325 million. Bitcoin has a market capitalization of $112 billion. Bitcoin price has moved by $188.69 (3.00%) in the last 1 week with a total volume of over $2.71 billion. The price surged to its highest on Monday, 15 October 2018 when it reached $7,234. The presence of bearish pressure is being reflected in most of the technical indicators and that could keep gains away. The 100 Simple Moving Averages (SMA) line is under the longer-term 200 SMA line on the daily time frame. This is a confirmation that the path of least resistance is in the downward direction. That is to say, resistance is more likely to hold rather than to break. Meanwhile, Stochastic is on the downside, thus, BTCUSD price might follow the same pattern while selling pressure remains. The Stochastic oscillator still has some room to go before it reaches oversold levels. Nevertheless, it indicates that the sellers could be in charge for a bit longer. Relative Strenght Index (RSI) 14 is also moving in the downwards and has a large room to cover before getting to the oversold territory. 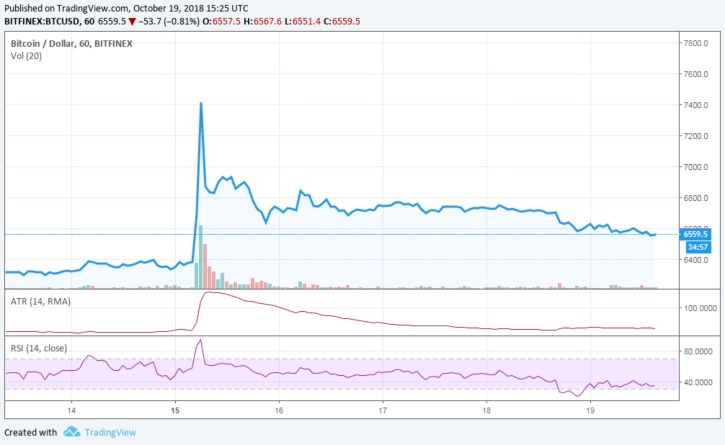 Further, the 1D chart reveals that there was an increase in selling pressure which was spotted just below the $6,500 levels in Bitcoin price. The BTCUSD pair has been struggling continuously to break the $6,700 resistance levels. As a result, there was a slight bearish reaction and the price dropped below the $6,450 level. It looks like the price failed to settle at the “Golden ratio” Fibonacci retracement level of the previous decline from the $6,827 high to $6,350 low. Hence, as Bitcoin got bearish once again, it is expected in the upcoming days that the coin might continue its decline below $6,200-$6,000 levels. The graph below explains that about 50% of the Bitcoin was traded in Tether (USDT), following US dollar and Korean won (KRW). Most of the trades were transacted in Bitfinex Exchange in the last 24 hours of trading.